Different backcountry users need different skills. A weekend warrior doing laps in familiar terrain in a familiar snowpack needs a different skill-set than the skier who does a destination backcountry trip each season to a unfamiliar hut in a remote region. Similarly the professional user has different needs than the recreational user. From ISSW to the many regional snow and avalanche workshops around the United States this season, there has been considerable chatter about the difficulties that avalanche educators have teaching the many different beacons currently on the market. In an effort to address different user needs, AIARE and the American Avalanche Institute have begun to develop curriculums specifically for recreational versus professional users. Keep in mind, many “recreational users” spend so much time in the backcountry that they may fall into the “professional user” group—people who are out frequently and devoted to being masters of their craft. From an avalanche transceiver development perspective, Mammut has recognized different user needs for a long time, which is why we offer the ELEMENT for recreational users and the PULSE with both basic and advanced user-profiles for ambitious or advanced users. Below, we will review some of the PULSE Barryvox’s features which cater to advanced rescuers. Details of these functions can be found in the PULSE REFERENCE MANUAL. Many of these features are also very useful for recreational users that are willing to spend a little more time mastering their beacon. All Mammut beacons employ advanced MARKING technology to allow users to simplify multiple burial searches. While multiple burials are certainly not the statistical norm, they do occur from time to time and marking technology makes complicated rescues much easier to solve. While statistics may show multiple burials to be rare causing some to downplay their importance, we would argue that it is more representative of their real importance to consider this issue in terms of the number of PEOPLE involved in those accidents. In fact, if you consider it from this perspective the % of the people caught in avalanches that are involved in multiple burials is much higher than some would have you believe. As an example, in Statistical analyses on multiple burial situations and search strategies for multiple burials, written by Manuel Genswein and published by the Swiss Avalanche Federation, out of 466 avalanche accidents recorded, only 127 or about 27%, involved more than one burial. What is noteworthy is that if we look at this from the perspective of the number of PEOPLE buried, the figure rises to 698 total people buried…that means that over 51% of the avalanche burials during the study period were involved in multiple burials! The exact percentages are going to vary depending on the region and the age of the data, but it’s clear from this example that choosing to look only at the number of accidents rather than the number of people involved in those accidents, under-represents the importance of addressing multiple burials if the goal is to save more lives. The fact remains that all burials are relatively rare—but that does not provide justification to leave your beacon at home, does it? Do not allow statistical manipulation to encourage you to settle for a beacon that is not capable of the industry standard--MARKING. Be prepared for worst-case scenarios. In 2008, while doing avalanche control for Jackson Hole Ski Patrol, I was involved in an avalanche that buried 4 ski patrollers. After the accident site was cleared of any other potential burials, another searchers’ beacon auto-reverted, creating confusion. This happened again a few minutes later. While auto-revert can provide a level of safety for rescuers, it can also cause chaos during a stressful rescue. Mammut has addressed this issue by linking auto revert to the accelerometer (motion sensor). NO REVERT IN MOTION: If the motion sensor in your beacon knows you are up and moving it will not auto-revert. This function is described on page 30 PULSE REFERENCE MANUAL. 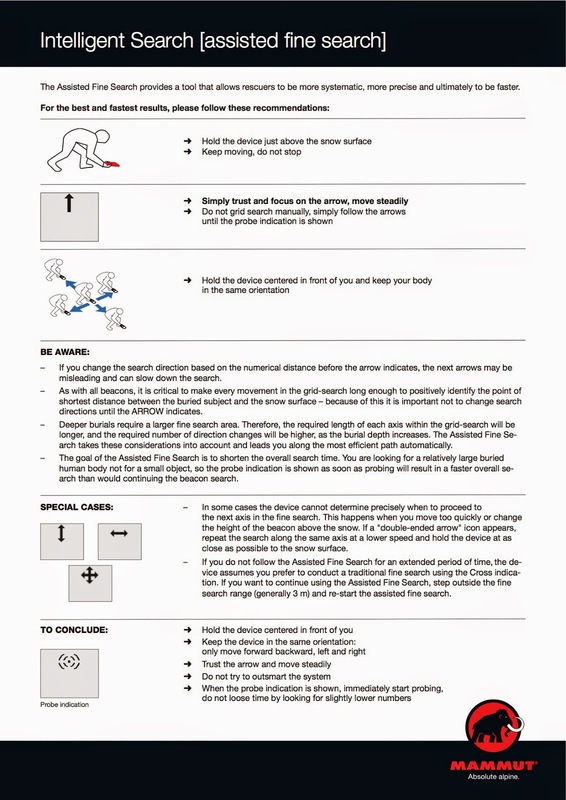 With the introduction of Firmware 4.0, Mammut introduced ASSISTED FINE SEARCH. This function guides the user through the Fine Search phase, ensuring that the rescuer follows standard grid search protocol—keeping the beacon in a single orientation and at ground level. While this appears at first to be a feature intended for recreational users, the fact remains that many users (including professionals) get sloppy with their fine search. ASSISTED FINE SEARCH makes users more methodical and efficient in the final stages of a beacon search. For a You Tube demonstration click here. Beacons have a limited range, some more than others. The PULSE and ELEMENT both have 60 meter ranges. However, if you are limited in your rescue resources, a longer range is very useful. By eliminating the display screen’s function, the PULSE reduces electromagnetic interference and increases power. The end result is a 95 meter range—very useful in large avalanches or in situations with limited resources. This feature is described in page 26 of the PULSE REFERENCE MANUAL. The PULSE Barryvox will alert you with a 457 Send Failure! message when it identifies electrical interference. Additionally, if the PULSE identifies that the signal you are searching for has suffered from signal drift, it will alert you to "reduce search strip to 25m." More on this topic can be found HERE. The aforementioned topics (Marking, No Revert in Motion, Assisted Fine Search, and Long Range Mode) are stand-alone features. Analog/Digital "Standard Mode" is an advanced configuration of several different settings of the PULSE which are optional--it's the setup we recommend to professional rescuers and others looking to prevent overlapping signals from complicating multiple burial situations. There is chatter from time to time about the statistical probability of multiple burials. The problem with statistics is that they distract us from the worst case scenario which is usually when tragedy occurs--tragedy, in this case, being a potentially fatal accident which could have been solved with prior training and modern technology. Modern technology—MARKING—assists in solving the vast majority of multiple burial rescues. However, there are instances when overlapping signals make the identification of multiple 457 KHz frequencies difficult. Mammut advises professional rescuers to train using the digital distance and direction display--while at the same time using analog audio. After all, what is digital audio other than a lab formulated tone to encourage someone that they are following the screen indicators properly—digital tones do not provide critical information. Analog tones, on the other hand, provide key information that is raw data—it does not lie because it does not interpret what it is receiving. Overlapping signals can usually be quickly identified using analog tone checks. We recommend advanced rescuers use Analog/Digital "Standard mode" (analog sounds simultaneously with digital distance and direction display.) In this mode rescuers can rely mostly on digital information while employing sound checks at 10m and again at 3m. These sound checks provide the rescuer with a mental map, ie. are victims buried in close proximity or are they reasonably separated. At the recommended sound check intervals (10m and 3m), simply ask yourself, "Is it possible you hear more than 1 analog tones? Is it possible you hear more than 2 tones?" These are simple questions that a rescuer can answer immediately with minimal training. These tone checks allow the rescuer to form a mental map about where the signals can possibly be coming from. At 10 meters (the point of the first tone check) the closest signal is obviously about 10m away. If a second tone is also heard then it can be no more than approximately 20 meters away--this is the maximum analog range possible at this proximity, as the receiving beacon automatically turns its own sensitivity down (all modern beacons do this automatically in the background). Proceed with your search. At 3 meters conduct another tone check. The analog range has now been reduced almost to its lowest possible level. If 2 tones were heard during the first tone check and 1 tone is heard during the second tone check, then you are dealing with a widely spaced multiple burial scenario. If 2 tones were heard during both tone checks then you are dealing with a close proximity situation. Also, for a more complete overview of this process and setting the user settings that we refer to as "standard mode", check out THIS ARTICLE which includes a review of how to set up this mode in the user settings of your beacon. When conducting a training exercise with a ski guide service, we were presented with a multiple burial scenario. I proceeded to search with another guide. We very quickly were on top of the first signal, which we probed. At this time we both marked the victim and both of our beacons responded with no information about the second victim. The ski guide proceeded with micro search strips (effective but inefficient in general.) I, on the other hand, had done an analog tone check at 3 meters and therefore knew that we had a close proximity burial. So, I had critical information that would have been unavailable with a digital-only beacon. The next step is knowing what to do with this analog based information. The answer is a Micro Search Box. Micro Search Box, You Tube Video here. If, during your 3 meter analog tone check, you have identified more than one signal, then you have a close proximity burial situation. After marking the first victim, your digital interface should indicate a second close victim. If your digital indicator gives you a large number or no number, then you have signal overlap issues. Proceed by going into analog-only mode (by holding both buttons for 3 seconds.) Move slowly away from the victim until you hear two tones. You have now identified the radius of the micro-search box (the first victim being the center.) Now follow the outer line of the box listening for strong tones and/or low numbers on the screen. You will walk directly over the victim. As with traditional Fine Search technique, do not change the orientation or elevation of the beacon during this process. Micro Search Strips, You Tube Video here. Micro Search Strips are used when you have multiple tones during your 10m tone check but only one tone during your 3m tone check. This indicates a well spaced multiple burial scenario. If overlapping signals are preventing you from finding your second victim, go into analog only mode. Search strip widths should never exceed 10m on the screen. Search strip depth should be 2-5. Because the of 10m parameters your search strips will efficiently follow the pattern of the burials rather than requiring you to search the entire debris field. For a demonstration on this technique by Swiss avalanche expert Manuel Genswein, watch this VIDEO. Some of the features mentioned in this article (namely the stand alone features) require no practice to use. Others (namely Analog Tone Checks, Micro Search Box, and Micro Search Strips) require practice. It is our belief that professional rescuers should be willing to practice for the most complicated searches, and we are willing and prepared to help you. If you are a Ski Patrol, Mountain Guide, or Search and Rescue Team and have further questions or would like personalized training on these skills, contact Doug Workman at mammutavalanchesafety@gmail.com.